It's Friday again and I've been excited to do this post for about six months of now (*eek*). This week saw the first anniversary of Pokémon Go's release in Europe (Happy Birthday!). 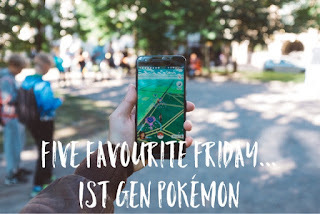 In honour of Niantic's viral game that I'm still addicted to, I've decided we'll dedicate this weeks Five Favourite Friday post to the first generation Pokémon, from the Kanto region. This gives us an opportunity to pick our favourites from the original 151. I didn't get caught up in the initial Pokémon craze, although I did watch the animated series on TV, as Ash tried to catch 'em all. So I only really got caught up in it all with the release of Pokémon Go last year, and that was because Nikki was excited for it's release! Since then I've been hooked and I've managed to catch 134 of the available 142 (excluding regional specifics and [currently] unobtainable Pokémon). I've picked my favourite five plus a handful of honourable mentions which you can see below. Its tail is large and covered with a rich, thick fur. The tail becomes increasingly deeper in colour as Wartortle ages. The scratches on its shell are evidence of this Pokémon's toughness as a battler. I never took to the poster boy Pickachu like everyone else, Squirtle is my favourite starter Pokémon. 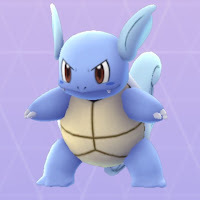 But since I started playing Pokémon Go I've favoured Wartortle as he was one of the first evolved Pokémon I saw in the wild. 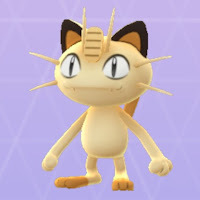 I'm a cat lover and, other than Squirtle, Meowth was the most memorable Pokémon from the TV series to me, accompanying Team Rocket in trying to defeat Ash. Adding some fire to proceedings is Arcanine. 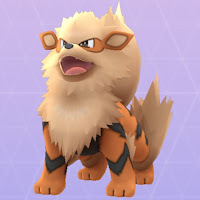 I'm a fan of Growlithe, but when I saw the size of Arcanine (its evolution), it had to be included! After collecting lots of Magikarp candies to try and evolve one in to Gyarados, I felt a sense of relief when I finally got the full 400 required. 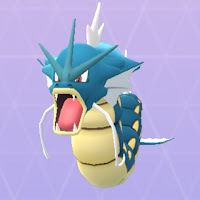 I did laugh though when Pokémon Go introduced Pinap berries (which increase the number of candies received from a Pokémon) and the water event shortly afterwards, making it much easier to evolve a Gyarados! My first evolution of an Eevee, and it was soon a dependable Pokémon that featured every time I went to battle a gym. 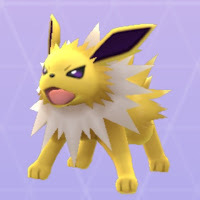 A lot of the gyms have water-based Pokémon on them near me, so the electric attacks from Jolteon prove to be super effective! So that's my five favourite 1st gen Pokémon, I'll give special mentions to Oddish, Voltorb & Omanyte which I really like because they're cool and also Lickitung which I find amusing, running up and licking the opponent. As always you can find Nikki's favourite Pokémon here on her blog. Next week we'll be looking at our favourite Disney songs (Nikki's choice! ).